Perhaps unknowingly, we’ve been heading toward the Steelhead Diner for years. Each job we’ve held and experience we’ve had has strengthened us in complementary ways and brought us toward finally collaborating with each other. This is our family business that we want to share with you. We met when we both worked at a restaurant called Bacall’s in Adelaide, Australia. We’re both avid long distance runners and love to eat (a good, and necessary, combination). We live downtown and love being part of city life. We’re concerned about our planet and support groups that practice sustainability and good-for-the-earth activities—fisheries; local growers, bread makers, cheese makers; organic and natural beef producers, etc. Our diner is a place of no pretensions where locals hang out, chat with others, watch the kitchen fun and have a great meal. 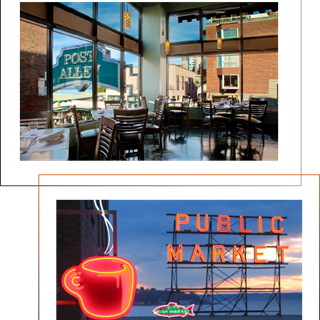 It’s the perfect place to bring out-of-town visitors. 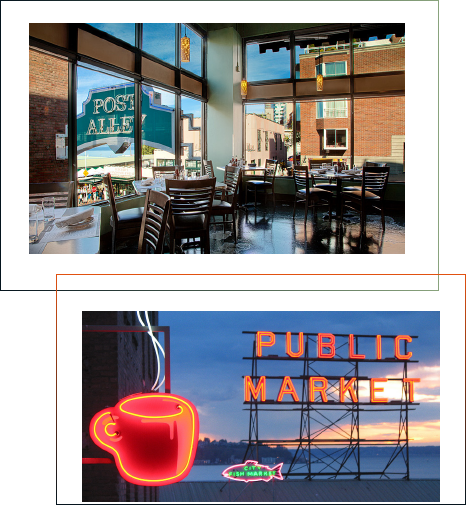 They’ll get a real Seattle experience—great local food in the historic Pike Place Market setting with a view of the Market, Elliott Bay and the Olympic mountains.